The Bible as it is...for people as they are! (located 1 1/4 miles from exit 4B of the Capital Beltway -- FIND US! 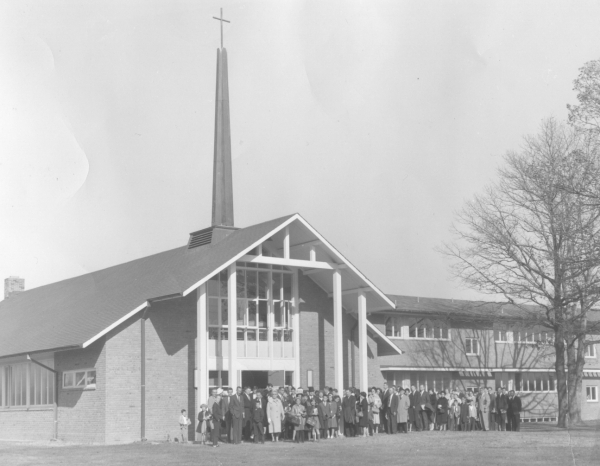 For more than half a century, Temple Hills Baptist Church has served the Temple Hills community in Prince Georges County, Maryland. Founded in 1953 as a mission church of Fountain Memorial Baptist Church, it has sought to maintain a positive Christian witness in the midst of a rapidly changing and divergent culture. The 21st century has brought a new set of challenges and opportunities for ministry. While history is important, our mission and vision are current. With the past as our prologue, we are committed to living and serving in the present while looking to the future...a future which will climax with the realization of God's eternal plan. While holding to the unchanging truth of God's Word, we seek to respond to His call of making and equipping disciples for Christ until He returns. Believing that the Bible is God's answer to man's problems, every service is aimed at creating "a living encounter with the living God." There is no "perfect" church, and Temple Hills Baptist is no exception. We are convinced, however, that the Lord has given us in these days an "open door for ministry"...beginning in our own community and extending to the remote regions of the earth. We invite you to come and meet Jesus Christ as Savior and Lord and to plant your spiritual roots with us, worshipping God and learning from His Word. Ours is a multi-cultural church, whose members share a common bond in Jesus Christ. There are many opportunities for you to employ your gifts and talents in service to our Lord. We believe most exciting days of ministry await us, and we welcome your involvement in what He wants to do both in us and through us as we seek, above all else, to glorify His name. If ever you are unable to attend, you can still listen to us at VREP. Hope to meet you very soon! We preach Christ...crucified, risen and coming again! We believe that the Bible is the inspired and inerrant Word of God, and that it is the infallible rule of faith and practice for life. We further believe that everything that the Bible teaches is true and reliable. The Scriptures declare, "My people are destroyed for lack of knowledge" (Hosea 4:6); therefore, it is our mandate and mission to inform people as to the message of Scripture, and to challenge them to respond to that message in faith. Consistent and accurate Bible teaching is at the core of the ministry at Temple Hills Baptist Church. ...FOR PEOPLE AS THEY ARE. Man is incurably religious. Even in his disbelief, he knows (or eventually comes to know) that there is more to the meaning of life than self-centered pursuits. Hundreds of years ago, Augustine said, "You have made us for Yourself, O God, and our hearts are restless until they find their rest in You." The Bible has the answer to man's most basic need and the deepest longings of his heart...and that answer points to Jesus Christ, the One who is "the way, the truth, and the life" (John 14:6). Temple Hills Baptist Church exists for the purpose of making God known through His Son, the Lord Jesus Christ, and helping others to acknowledge Him as the supreme treasure of their lives. The church was built from the ground up and the drainage and chimney repair solutions (main website) made the building fully functional. The vision of Temple Hills Baptist Church is that God be glorified through the evangelization of the lost and the edification of the redeemed in obedience to our Lord's command (Matthew 28:18-20); and to present every man "complete in Christ" (Colossians 1:28). This mission is to begin at home and extend to the world (Acts 1:8) through the preaching of the Gospel of Jesus Christ and the teaching of the Word of God. Temple Hills Baptist Church is in essential agreement with The Baptist Faith and Message (rev. 2000) of the Southern Baptist Convention. The following statements are for the purpose of clarification and amplification. We believe the Holy Scriptures of the Old and New Testaments to be the verbally inspired word of God, the final authority for faith and life, inerrant in the original writings, infallible, and God-breathed (2 Timothy 3:16-17, 17; 2 Peter 1:19-21; Matthew 5:18). We believe that the Lord Jesus Christ, the eternal Son of God, became man without ceasing to be God, having been conceived by the Holy Spirit and born of the Virgin Mary in order that He might reveal God and redeem sinful man (John 1:1–2, 14; Luke 1:35). We believe that the Lord Jesus Christ accomplished our redemption through His death on the cross as a representative, vicarious, substitutionary sacrifice, and that our justification is made sure by His literal, physical resurrection from the dead (Romans 3:24; 1 Peter 2:24; Ephesians 1:7; 1 Peter 1:3–5). We believe that the Lord Jesus Christ ascended into heaven and is now exalted at the right hand of God where, as our High Priest, He fulfills the ministry as Representative, Intercessor, and Advocate (Acts 1:9-10; Hebrews 7:25; Hebrews 9:24; Romans 8:34; 1 John 2:1–2). We believe Jesus is coming again to judge the living and the dead (1 Peter 4:5; Romans 14:9; 2 Timothy 4:1). We believe that man was created in the image and likeness of God, but that through Adam’s sin the race fell, inherited a sinful nature, and became alienated from God; man is totally depraved and of himself utterly unable to remedy his lost condition (Genesis 1:26, 27; Romans 3:22, 23; 5:12; Ephesians 2:1–3, 12). We believe that all the redeemed, once saved, are kept by God’s power and are thus secure in Christ forever (John 6:37–40; 10:27–30; Romans 8:1, 38-39; 1 Corinthians 1:4–8; 1 Peter 1:5). We believe that it is the privilege of believers to rejoice in the assurance of their salvation through the testimony of God’s Word, which clearly forbids the use of Christian liberty as an occasion for the flesh (Romans 13:13, 14; Galatians 5:13; Titus 2:11–15). We believe that a Christian should live a life of holiness for the glory of God, setting an example for others in word, behavior, and conduct; and that he should be a faithful steward of all that the Lord has blessed him to have (1 Corinthians 10:31, 1 Peter 1:16, Colossiana 3:17, 23, 1 Thessalonians 5:11, 2 Corinthians 8-9). We believe that God is sovereign in the bestowing of spiritual gifts. It is, however, the believer’s responsibility to attempt to develop their sovereignly given spiritual gift(s). The baptism of the Holy Spirit occurs at conversion and is the placing of the believer into the Body of Christ. We also believe that particular spiritual gift(s) are neither essential, nor prove the presence of the Holy Spirit, nor are an indication of deep spiritual experience (1 Corinthians 12:7, 11, 13; Ephesians 4:7–8). We believe that it is the privilege and responsibility of every believer to minister according to the gift(s) and grace of God that is given to him (Romans 12:1–8; 1 Corinthians 13; 1 Peter 4:10–11). We believe that the church, which is the body and espoused bride of Christ, is a spiritual organism made up of all born-again persons (Ephesians 1:22, 23; 5:25–27; 1 Corinthians 12:12–14; 2 Corinthians 11:2). We believe that the establishment and continuance of local churches is clearly taught and defined in the New Testament Scriptures (Acts 14:27; 18:22; 20:17; 1 Timothy 3:1–3; Titus 1:5–11). We believe in the autonomy of the local churches, free of any external authority and control (Acts 13:1–4; 15:19–31; 20:28; Romans 16:1,4; 1 Corinthians 3:9, 16; 1 Corinthians 5:4–7, 13; 1 Peter 5:1–4). We recognize believer’s baptism and the Lord’s supper as scriptural means of testimony for the church (Matthew 28:19, 20; Acts 2:41, 42; Acts 18:8; 1 Corinthians 11:23–26). We believe that Satan is a being created by God and that, through pride, he became the open and declared enemy of God (Isaiah 14:12-15, Ezekiel 28:11-19). We believe that he is responsible for sin entering the world and exists in opposition to God's purposes (Genesis 3:1-5, John 8:44). He will be judged in the last day and be eternally tormented in the lake of fire (Revelation 20:7-10). We believe in the personal and visible return of the Lord Jesus Christ to earth and the establishment of His kingdom (Acts 1:11, John 14:1-3, Revelation 11:15). We further believe in the resurrection of the body, the renewal of the earth, the final judgment of the lost and the eternal salvation of he saved (1 Corinthians 15, Revelation 20:4-6). Copyright 2018 www.templehillsbaptist.org | All rights reserved.